My first month at Texas Tech, my newly appointed fraternity big brother, Sammy, gave me my very first shirt with my Greek letters sewn on it. It was a bright gold cotton Russel sports jersey. I loved that he hand selected the Greek letter patches and even added “Sam’s little bro” embroidered in white on the left chest (where a Polo horse was usually found). In those first few lonely weeks away from home, starting college for the first time, I was completely surprised by his gift. It made me feel like I belonged….and I wore it everywhere. Sadly, I lost that shirt 3 years ago when we moved into this house (along with all my Fraternity shirts)….I can’t even find a picture of me wearing it. But, I remember it well…..and especially how it made me feel when I wore it. I still have an attachment to chenille patches. Like anything else I can find at a junk shop for about a dollar. Here’s a few of the cool ones. 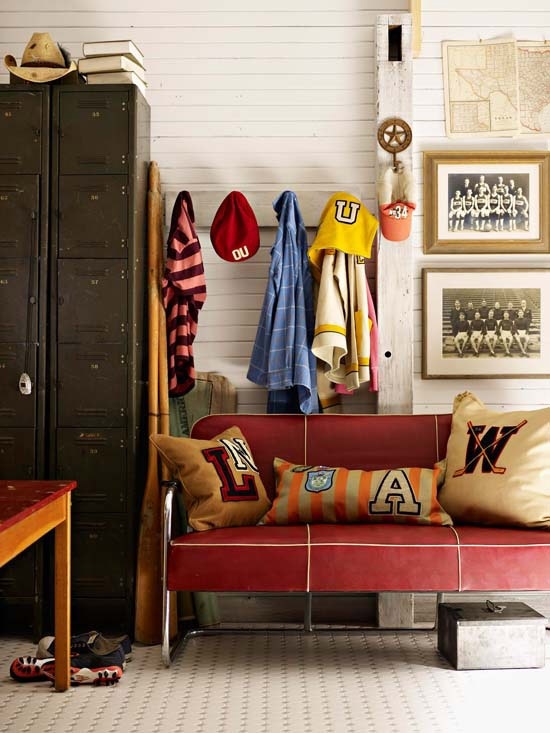 Really diggin’ these pillows in this Better Homes and Gardens pic. Might be because they remind me of the ones I made for our den. About 10 years ago, I found a Letterman’s jacket in the street while walking my dog, Faust. The jacket was trashed, but the patches were “SWEET”. The previous owner had gone to Woodrow Wilson High School, and played baseball. A LOT of baseball. He was even varsity catcher. 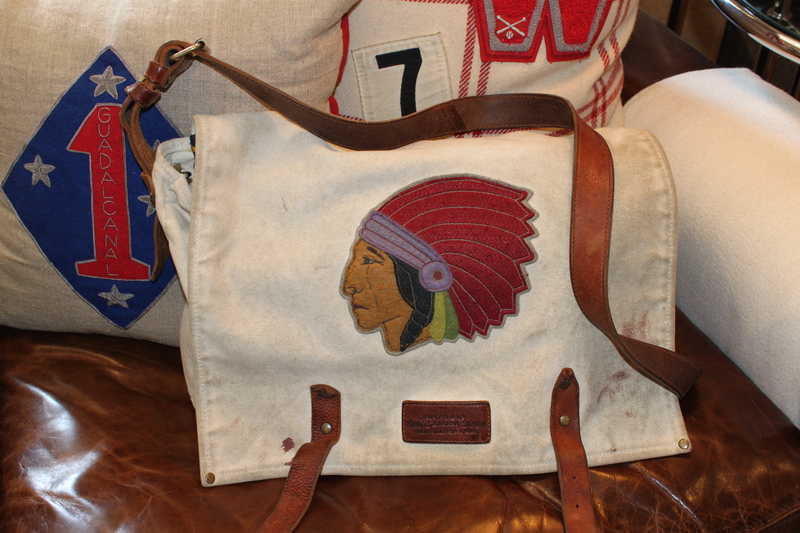 That’s where the big “W” and the “Varsity Catcher baseball” patches on the pillows came from. 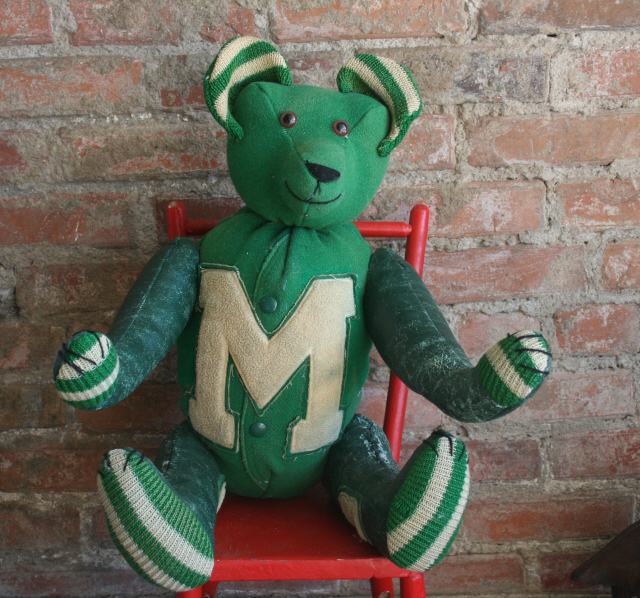 Not that I am claiming to have invented patches on pillows..
SternseyBears.com will make a teddy bear from your old Letterman’s jacket, even one you find in the street, and for about $150. They will find a way to work the old patches in. Here’s my daily commuter bag. Had it for years, it goes everywhere I go. The indian head. Added that myself. 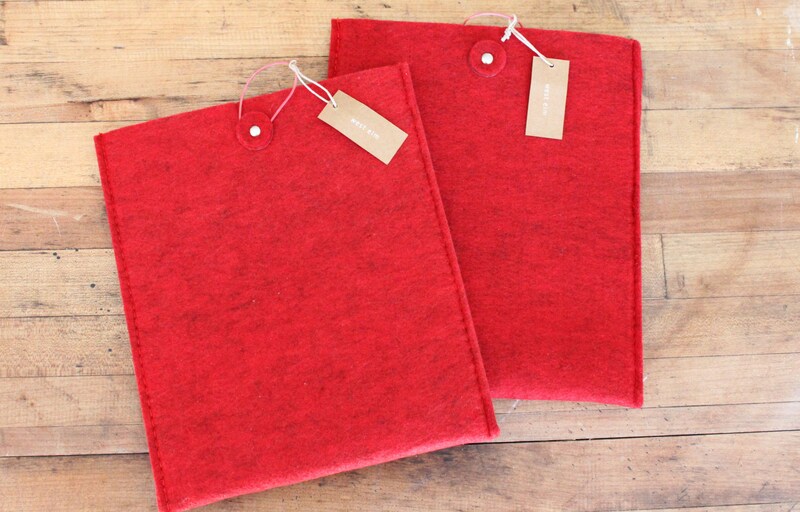 Jamie picked up these felt pocket iPad covers from West Elm in the clearance section for about 2 bucks each. I know there are long gone now, but anyone could just substitute felt to make their own. Look how great they look with these large black patches. In case you aren’t lucky enough to find an abandoned Letterman’s jacket just laying in the street, I found a place online that sells them, Anything Chenille. Ebay and etsy are great sources too. Think outside the box and sew them on things. ← Lie Down with Dogs…..
Super cute ideas! LOVE that teddy bear. Thanks for your great posts. Glad that you like them Doni Jo, Thanks for reading along……. Love, love all of it and I just love these emails every week. You guys inspire me! James, I love your Texas Tech memories! Aww. And patches! Years ago, I found a vintage volleyball (I think) jersey with ‘TECH’ in chenille. I always think about restyling the letters, but I can’t bear to tamper with the red, thickly silk-ish woven jersey. 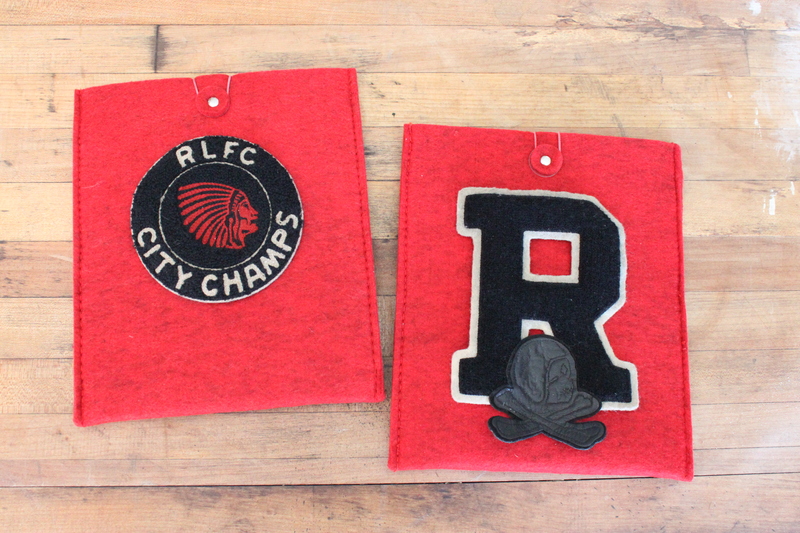 I’m in process of turning a mohair sofa into a Rugby inspired patch extravaganza, wee! If I ever finish, I’ll share. Love your pillows. And blog! Love reading your blog, it always puts a smile on my face! Especially knowing you’re a fellow Red Raider! 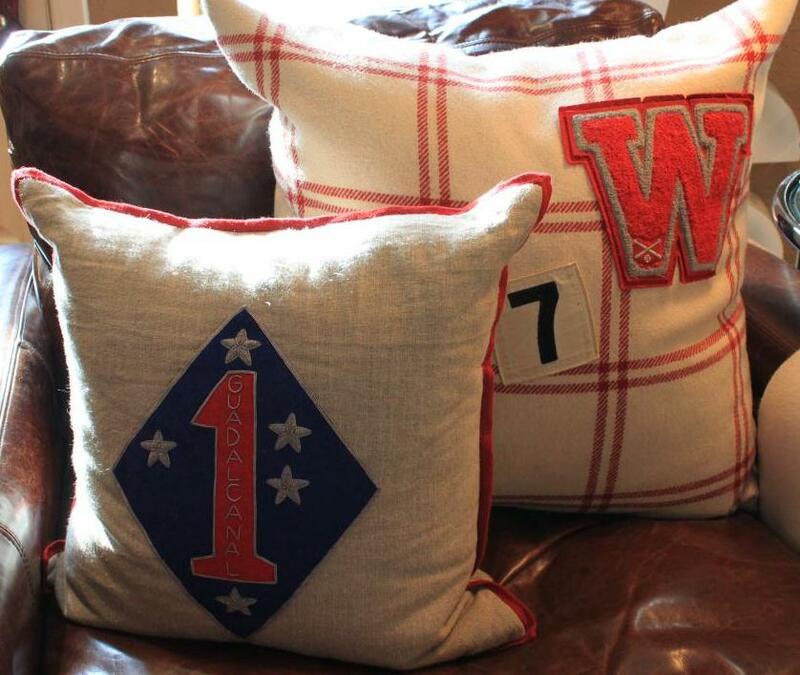 My husband still has his fraternity jerseys and I should turn them into pillows! Glad that I can make you smile……..Go Red Raiders! 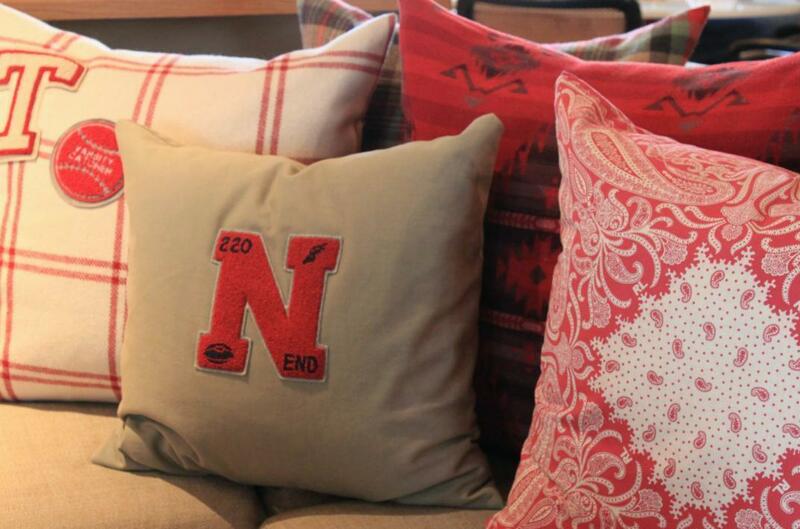 Frat shirt pillows just screams “Man Cave”! Hey thanks soo sooo much for the IDEA…I lettered in VERY little in school…but none the less I have those patches and now by golly I am making some pillows with them….C H S EAGLES…..
Glad that I could inspire, check eBay and etsy for more vintage ones. You’ve shared a lot of good and creative ideas. I liked your post too. I would also like to use in your ideas. I am very enjoyed for this site. It’s very informative topic. I think it may be assist all of you. Thanks a lot for this beauty Enjoying article with me. I appreciate it very much!